Amplitude / eccentric moment can be easily adjusted from minimum to maximum with a variable motor (phase shifter). The variable moment (phase shifter) of OVR (Excavator Mounted Vibro Hammer) Variable Moment Vibratory Hammers adjusting the position of the eccentric masses. 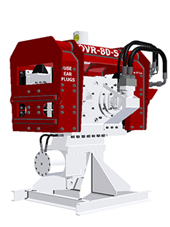 The variable moment (phase shifter) of OVR Series Variable Moment Vibratory Hammers adjusting the position of the eccentric masses according to start and stop of the vibration case (gear box) to not generate resonance. Thus, the vibration case vibrates at maximum frequence and this reduces the disturbance to surrounding soils.